Farmers and other groups that are particularly vulnerable to the adverse effects of climate change need effective risk management strategies. This column outlines the potential and practicalities of implementing climate insurance for farmers in the dry zone of Sri Lanka. Timely and accurate data on rainfall are essential to its success, as is a program of education for farmers on climate insurance in general, and more specifically, index-based insurance. Communities whose livelihoods are dependent on climatic conditions are particularly vulnerable to the adverse effects of climate change. Dry zone farmers in Sri Lanka, for example, have experienced significant deviations in the rainfall pattern in recent years, and increased occurrences of climate-induced disasters. Their livelihoods are under threat from the floods and droughts that have alternated over the last five years. Uncertainties are inherent in agricultural livelihoods, but the new climate trends are adding to them, threatening the traditional way of farming in Sri Lanka. This calls for effective risk management strategies for farmers – and one tool that is commonly proposed is index-based climate insurance. In a recent study, its potential and practicalities were examined. 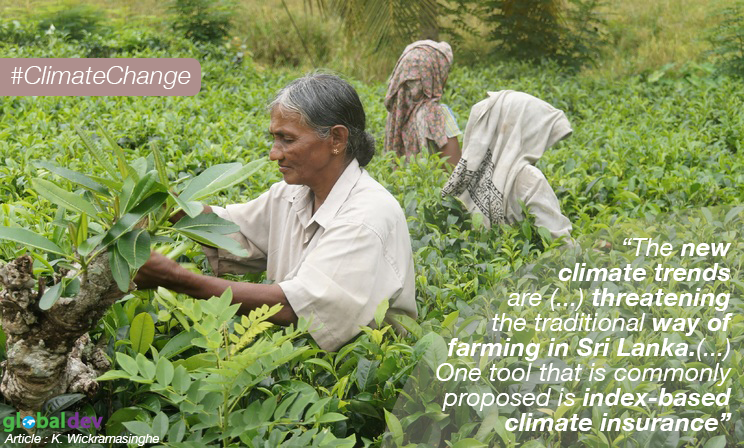 Climate insurance in the form of crop insurance has been in existence for decades in Sri Lanka, primarily because it is a prerequisite for obtaining agricultural loans from formal financial institutions. The Agriculture and Agrarian Development Board is the agency that handles crop insurance offered by the government. Two private insurance companies also offer crop insurance products in combination with the agricultural loans provided by its partner bank. Traditional crop insurance products in Sri Lanka take the indemnity-based approach, according to which insurance payments are calculated based on field-level assessments of losses due to identified disasters. Field-level loss assessment involves high costs in terms of both time and money. There are also many transparency-related issues for farmers, which lead to loss of trust. Almost all the problems with indemnity-based insurance are seen in the Sri Lankan context, including adverse selection and moral hazard. These issues might have led to low coverage levels of crop insurance over the years. The alternative is to move towards index-based climate insurance, which makes use of an objective parameter such as rainfall that has a close correlation with crop yield. It is thus able to get past an array of problems with indemnity-based insurance. We conducted a series of field-level discussions with farmers about the climatic challenges that they have experienced over the past two to three decades. It was striking that they could recall bad years as far back as the 1980s and the specific difficulties that they went through then, primarily due to climate-induced events. The frequency of bad years showed an increasing trend when it came to their memories of the past ten years. We then matched the farmers’ experiences with data from the Climate Hazards Group InfraRed Precipitation with Station (CHIRPS). CHIRPS is a quasi-global rainfall dataset covering the period from 1981 until present. The Sri Lankan farmers’ experiences with heavy rains, floods and droughts in a given month of the bad years are directly comparable with the rainfall anomalies shown in the CHIRPS maps. This suggests that implementing rainfall index-based climate insurance in Sri Lanka is technically feasible. It is also encouraging that a private insurance provider pilot tested index-based insurance for farmers in Sri Lanka. In addition, government crop insurance providers are considering the index-based insurance option. The availability of timely and accurate data is a crucial factor in the practical implementation of index-based insurance. Time series data are essential for designing the insurance product. In this sense, both data generation and efficient data-sharing are equally important. Rainfall in Sri Lanka is primarily measured by the Department of Meteorology. In addition, there are several institutions that gauge rainfall, including the Irrigation Department and the Department of Agriculture. But the number of existing rainfall stations is inadequate to implement successful index-based insurance. There have been attempts to establish automated rain gauges in selected areas, which should be developed further. It is also essential to establish an efficient data-sharing system among the data-generating agencies and the data users, including the climate insurance providers. The shift from indemnity-based insurance to index-based insurance calls for effective ground-level interventions. The government and private sector insurance providers have to conduct an effective education program for farmers on climate insurance in general, and more specifically, index-based insurance. It is also vital to have meaningful community participation in the design and implementation of insurance. Kanchana is an Economist by training, with research interests in environmental and natural resource economics, agricultural economics, and poverty analysis. She won the First Prize for the Japanese Award for Outstanding Research on Development (ORD) in the Global Development Awards and Medals Competition of the Global Development Network (GDN) in 2014. Welcome to our blog site supported by GDN. Disclaimer: Views expressed in the blogposts are those of the authors and do not represent the position of GDN or any other institutions that support the blog. © 2017 GlobalDev. All rights reserved. "Today’s development research mixes scientific endeavor with technical advocacy. Scholars are encouraged to contribute research-based solutions to development challenges, and are expected to distill recommendations from their analysis and evidence. They are also advised to communicate the implications of their findings in ways that can reach policy-makers and practitioners most effectively, and then demonstrate their impact on decisions and outcomes." By Founding Editors , "Editorial – Mobilizing development research to address global challenges"